Events like trade shows and conferences can be the cornerstone of any month, quarter, or year. Whether you are attending or hosting, theses circled dates on calendars hold a world of potential in terms of education, relationships, and opportunities. However, with so much to gain during these events, there can also be a considerable amount to lose. Marquee events like multi-day conferences, and even single day trade shows require an immense amount of resources. Massive investments in time, capital, and people go into planning, implementing, and executing these events. The same is true for those in attendance. According to a study from CEIR, 78% of trade show attendees travel over 400 miles. With so much invested from both hosts and attendees, offering the best experience possible is vital. So take a look at some of the latest event trends that can pay dividends. 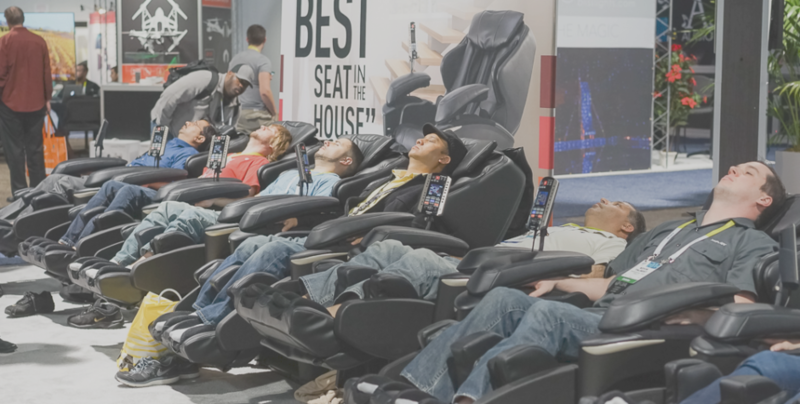 Conferences and trade shows can be a physical strain for attendees so consider offering complimentary massages. Just 5 minutes of a back massage can do wonders and wow your attendees. It can be relatively cheap to hire and something your attendees will be sure to remember. Offering massages can also be a great way to sell as you can expect to have attendee’s full attention or cooperation. Consider taking surveys or gathering data in exchange for free massages. People that attend your event are already believers, fans, and followers of your brand. With that said, there is one amenity that you can offer to your attendees that can elevate you to a hero’s status: phone charging solutions. Posting social media updates, staying in touch with family and co-workers back home, and keeping up with everyday tasks can quickly take their toll on everyone’s devices. From phones to tablets to laptops, the time is going to come during any well spent day where are a recharge is going to be necessary. This is where portable power packs and charging lockers can help to turn a good event into a great one. Having a charging station at your event will also benefit you as it is custom wrapped in whatever advertisement you want. A great idea would to have your new product advertised on the charging station. This may sound obvious, but WiFi has become less of an amenity and more of an essential necessity. The days of offering a “guest access” or WiFi that only works in a certain area, and only with limited participants are gone. Leveraging the power of highly performing broadband as well as supplemental hotspots can provide everyone the ability to connect, communicate, and enjoy all that your event has to offer. Again this may sound obvious, even simple, however signage is a highly important and often underappreciated element of any trade show or conference. You can never have enough signage! Your signage, whether digital or otherwise should reflect your brand and your event; but most importantly it should help everyone, internal and external, find their way around. The latest event trends include outdoor signage that helps attendees to the venue, and indoor signage that helps them navigate their way from session to session. Another thing that can enhance your event’s signage strategy is that they be flexible. Should a session move from one room to another, or additional speakers are added, having the space and ability to add new informational directions can be a benefit.